This is a performance movie and what a performance. When Tom Hardy is given the opportunity to act in this biographical film he delivers, brilliantly. Sadly not all of Bronson is as good as its lead actor. 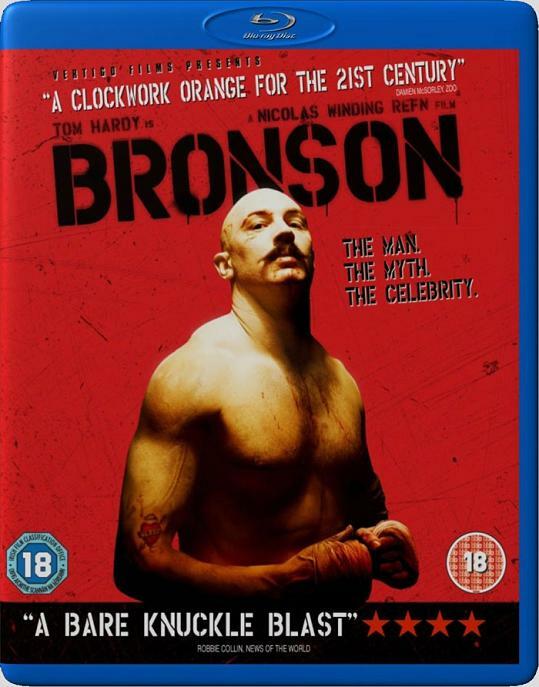 Bronson tells the tale of Britain's most notorious inmate. A walking, talking ticking time bomb of violence whom the movie does well not to glorify. From his humble beginnings in Luton to his life of pretty average crime and very long punishment. Bronson, who was born Michael Peterson before renaming himself, thrives in prison. He wants desperately to be famous and eventually achieves that following a stint at Broadmoor High Security Psychiatric Hospital where he kick starts one of the most famous prison riots in Britain in recent memory. The film, which is attempting a character study, succeeds in making Bronson life like and full of colour, but also troubling and rarely one you sympathise with. He's on a mission to be notorious and succeeds by punching and kicking the crap out of people. The film, unfortunately, misses an opportunity to tell the real story snapping back and forth between a biographical style and art house interludes as director, Nicholas Winding Refn, tries to get under Bronson's skin. The sequences, whilst visually well done (Hardy performing on an imaginary stage to an audience), jar against the rest of the film. We don't need them there to make a judgement call on Bronson's character, anyone who's still in jail from an original seven year sentence passed down in 1974, clearly has some issues. The motivation is clear, the madness is clear, but the stage sequences don't work set against Bronson's ineloquent character that we see during the scenes set in the real world. Hardy's performance is worth watching the movie for alone. It's a thoroughly believable portrayal of one of the most interesting characters to have ever been jailed in this country, it's just a shame that some of the film tries that bit too hard to tell us that Bronson's a nutter. It never really gives you the sense that Bronson is still serving time for stealing £26.18 thirty six years ago by keeping his sentence topped up with the odd out burst of chilling violence. And that's the most interesting thing about him, that he wants to be there, stuck in solitary confinement, until his fame dips to an unacceptable level and he kicks himself back to where he thinks he deserves to be. The film tries to hard to express all that and ends up not expressing it at all. Rent this for Hardy, he's mesmerising. The rest of the film, not so much.